"A Collection of Family Treasures"
294 pages, 8.5x11", color hardbound book, ISBN 978-1-936091-13-3. Of the many families treated in this wonderful book, below are only a few of the earliest: Reuben C. Dement 1780/1850, Josiah Brandon Dement 11-26-1806/11-25-1884, John M. Dement 1813, James Prentiss Dement, Sr. 1814/1867, James Gilland Dement 12-9-1834/11-28-1915, James Prentiss Dement, Jr. 2-23-1840/8-?-1906, Ida Russell Dement Easter 12-13-1875/2-18-1959, James Markham Dement 1895/5-?-1977, William Edward Dement 1899/10-15-1964. Table of Contents or "Index"
Runnels-Reynolds & Such "An Unfinished Work of Love"
8½x11", softbound book, 594 pages, includes information on allied lines/families and coat of arms. 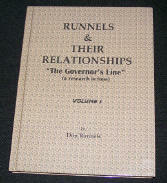 Runnels & Their Relationships, "The Governor's Line"
8½x11", hardbound book, 356 pages, indexes includes color coat of arms, photo, and Runnels Cemetery Records. This particular book deals with various Runnels family members, including Harmon Runnels, Revolutionary War Patriot, Georgia legislator and founder of Monticello, Mississippi; Hardin Dudley Runnels, Mississippi sheriff and legislator who took up a Texas land grant; Hiram G. Runnels, teacher, postmaster, legislator, Mississippi Governor and Texas legislator; Howells Washington Runnels, attorney and Mississippi legislator; Hardin Richard Runnels, Texas plantation owner, legislator and 5th Governor of Texas and Stephen Heard, Revolutionary War Patriot and Governor of Georgia. Other families covered in the book include Darden, Fort, Heard, Hubert, Neeley, Smith, Stamps, Sugg and Terry. Some of the other families touched on include Anderson, Bell, Beten, Bowery, Galvani, Gray, Hayes, Hopkins, Hunt, Strayhorn, Stubblefield, Turquette and White. 128+ pages, hardbound book, includes photographs and color crest. Genealogy! What a magical word. I am just an average person, interested in finding my family roots. I had been told throughout the years who my relatives were............but I didn't pay any attention until my wife motivated my interest in this direction. Now I’ve been involved with my ancestors since 1987 and have retired to Florida. I was lucky enough that one of the National and State Archives were located in Atlanta, GA. I was surprised to find that there was a lady in Texarkana, TX who had inquired about my family name some years previously. With special acknowledgment I would like to thank Catherine Ann Runnels Burch of the Governor’s line; who strived endlessly to link our two families together and was a motivation in my research. Since that first contact with this genealogist, I have been involved in a never ending search. To this fine lady, I owe everything I ever learned. Sometimes it is frustrating, sometimes it is exciting, sometimes it is boring, but in the long run it is the most addicting adventure one person can ever undertake. This undertaking of my family records could not have been possible had it not been for the encouragement, perceptiveness, and the deep understanding love devoted to me by my wife. The name "RUNNELS" can be found to be spelled some 49 different ways. When researching the name, it was found to have been listed differently even within the same document. 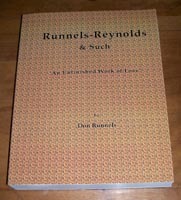 "REYNOLDS and "RUNNELS" are both interchanged at random and it is difficult to identify it they are talking or recording different people. So with this in mind; I have continued this search with the hope I can piece the information together. Having an Engineering background; I reasoned to write all names on a giant piece of paper showing the connections on my family. As I would find a name from a contact, I would write them and send a layout, showing the genealogy tree growing and ask them to fill in their relationship. The tree kept spreading and growing as the names were added, which I’m sure increased an interest to be on it, until I reached the point I had to purchase a computer to keep up with the information. Since that time, I have been constantly adding information into a document to track my families growth. Since I have not yet accomplished my original goal of researching my family side, it has grown to be a challenge. But even then, I am hooked on genealogy. Hopefully it will never find an end and that it will continue even after I am called to leave this old world. For there should be no greater love than family. This small portion of family records is a way I can repay some of the help to those who still struggle in finding their connection with the past life. Some information contradicts others; but it was recorded as it was passed on to me and should be used with that understanding. I can't help think of the information someone can hold; either doing some small research for themselves or others; or old documents and records passed along from family to family. Some researchers spend hours, days, months and years; searching for information on their family when others have that information readily available to them and don't know how much it means to share. The above and following is an accumulation of linkages from other genealogists and persons concerned to link to the Runnels family. I am not responsible for any false information supplied this writer even though it was done in good faith. We all search for family ties and because these people supplied this information; it is understood that it was through their effort that such a document could be generated. It is the hope of this writer, that the information gathered within, will be used as a platform to encourage someone else to continue the research into their family heritage. The old stories discovered about an individual are better that the best selling novel. 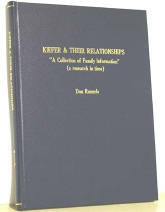 I have enjoyed writing Runnels and Their Relationships - The Governor’s Line, Runnels/Reynolds & Such - An Unfinished Work of Love, and Kiefer & Their Relationships - A Collection of Family Information published by The Gregath Publishing Co., PO Box 505, Wyandotte, OK 74370. The latest one published is The Beauty of DeMents - A Collection of Family Treasures.